Join us on this unique day tour from Dublin, let us take you on a fascinating journey through Ireland’s past, explore Belfast’s remarkable industrial heritage, its troubles, and its remarkable rebirth. We depart Dublin at 0800 am and return to Dublin at 1800 hrs. We have gaurenteed tickets for the World’s largest Titanic Experience, you will also have free time to explore Belfast city. The story starts in the first gallery with 1912 “boomtown Belfast” and takes you in a caged lift to the fourth floor for an atmospheric six-minute cart ride through the shipyards. The third gallery is based around a glass apex with a film projection re-creating the completed Titanic on the slipways outside. It launches into dry dock for fit out, with depictions of the first-, second- and third-class cabins in the next gallery. The cave section is a journey through the bowels of the ship, projected on the walls. Gallery five is based on the ship’s maiden voyage and re-creates life on board. In the next gallery, the walls narrow and the temperature drops as we trace the timeline of the sinking from iceberg collision to final gasp of air on April 15. The British and American inquiries into the disaster follow in the next gallery. The final two galleries are just as evocative, devoted to the legends of the ship, with touchscreen displays of Titanic folklore and a voyage to the Nova Scotia seabed where the wreck now lies, using film footage of an ocean dive in 1985. 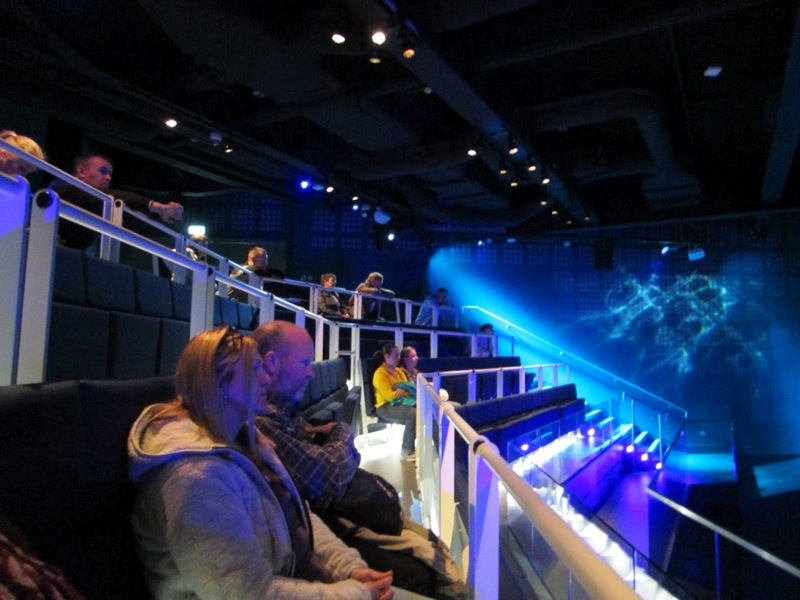 An Ocean Exploration Centre, developed with marine biologists, completes a memorable visit. Of the city’s 17 walls, West Belfast’s sections are the most visited. Once in the area it’s easy to determine which side of the divide you’re on: red, white and blue kerbstones, Loyalist murals and Union Jacks indicate you’re on the Shankill. If the kerbs are green, white and gold, the flag is Irish and the murals are Republican, you’re on the Falls. You can cross from one side to the other via access roads at Lanark Way and Northumberland Street. The best viewing section is on the Shankill side where visitors are encouraged to add their signatures to those of the Dalai Lama and former US President Clinton. Art panels showing the area’s political and cultural history have now been added to the wall along Cupar Way (off Lanark Way). Look out for the Orange Order, Battle of the Somme and modern-day international conflicts on this colourful stretch – with blank sections still there for those all-important ‘Give Peace A Chance’ daubs. The Shankill dates back to the Stone Age, making it the oldest settlement in Belfast. Shankill Road was named in 1831 after the Gaelic Sean Cill meaning Old Church. Today it is a bustling street with shops, cafes and the renowned Shankill Leisure Centre. Explore its Peace Walls and Unionist murals resplendent with Union Jacks and tributes to the Royal Family. One mural of note, beside the Rex Bar, depicts Unionist MP Edward Carson leading the signing of the 1912 Ulster Covenant opposing Irish Home Rule. Bi-lingual street signs and fluttering Irish flags are the first things visitors often notice when they walk along the Falls. Many murals depict scenes from the Irish Famine or the Nationalist side of the modern political conflict. The most photographed of the latter is on the side of the Sinn Fein offices and features IRA hunger striker Bobby Sands. The area is becoming known as the Gaeltacht Quarter. Most people know of the huge Irish Famine migration of the mid 1800s, but few are aware that the first attempted emigration from Ireland to the ‘New World’ was by Ulster-Scots. From these migrants there came a distinguished Ulster-Scots Presidential Roll of Honour including five consecutive Presidents of Ulster-Scots descent from 1885-1909. In more recent times lineage has been traced linking Nixon, Carter, Bush Snr., Clinton and Bush Jr with our northern shores. On President Clinton’s historic visit to NI in Nov 1995 he declared, “I am proud to be of Ulster-Scots stock; I share these roots with millions and millions of Americans…” Other prominent Americans of Ulster-Scots descent include Alamo legend Davy Crockett, writer Mark Twain, actor James Stewart and spine-chilling poet Edgar Allen Poe. Who would have thought such a tiny corner of Europe would have had such an influential role in the formation and development of the USA? Uncover our American roots and spend time exploring some of the following related attractions. Wherever you go in the city there’s no escaping Samson and Goliath, two giant, moveable yellow cranes looming over what was once the world’s biggest shipyard. These engineering heavyweights stand at 96m and 106m high, 140m wide and were built in 1969 and 1974 respectively. 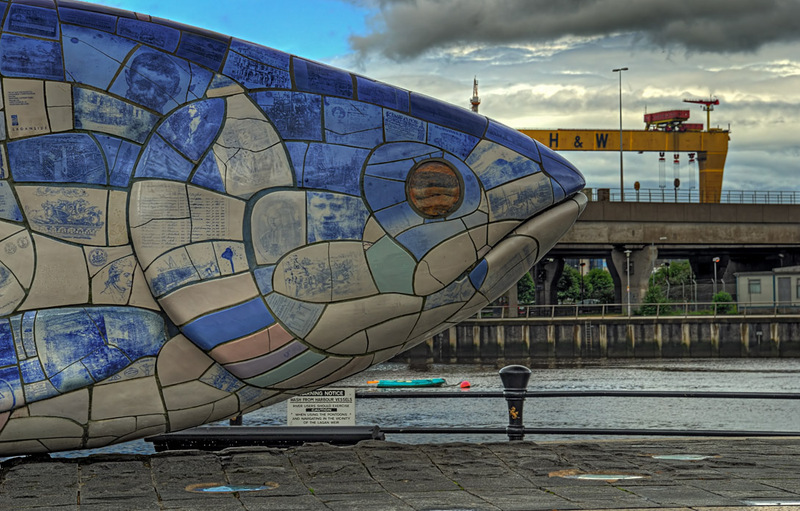 Despite the demise of Belfast’s shipbuilding industry, they have been preserved as historic monuments. We offer you a fantastic unique option, which allows you plenty of time to explore the spectacular Titanic Experience (2 hour stop) plus (2 hours free time) in Belfast city. Take all the hassle out of your day tour to Belfast, with guaranteed entrance at the world’s largest Titanic exhibit, right on the very slipways were she was built. We also include a tour of the political murals on both the Falls and Shankill road, with a visit to the peace wall. 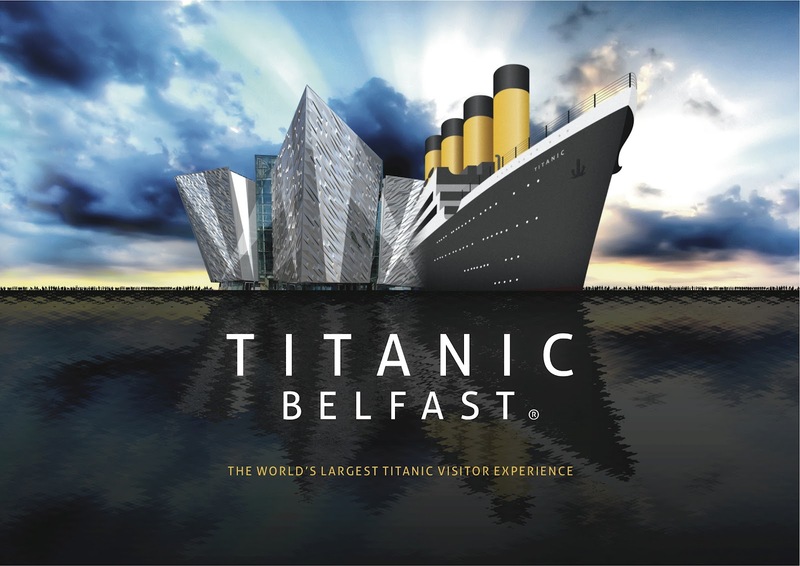 We have prebooked guaranteed fast track tickets at Titanicbelfast. So here is the deal. Option 1 Book with us here’s whats included! Option 2 Travel by train from Dublin – Belfast? 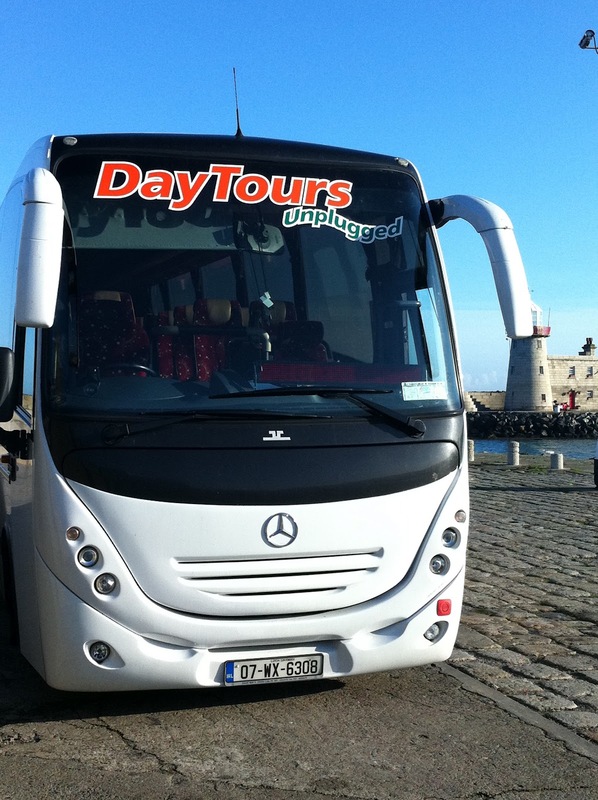 Firstly this is a day tour from Dublin runs every Tuesday, Thursday, Sat & Sun. We have guaranteed tickets for Titanic Belfast. You will need to book online well in advance. It goes without saying that the outside of the £90 million building is extremely impressive. Constructed to look like the famous ship its 14,000 sq.m and is twice the size of Belfast’s City Hall. The first thing that you notice about the ‘the world’s largest Titanic visitor experience’ from afar are the 3,000 individual silver anodised aluminum panels which make up its external façade and seem to always catch the sunlight, simply stunning. Walking around the Titanic centre you will notice that at least three of its four 90ft ‘hulls’ are in view at all times; this coupled with the reflective pools of water which surround it give the impression that the building could sail away at any moment. With such an impressive exterior, the Titanic Belfast really had a lot to live up to with its interior, and it didn’t disappoint. As you enter the building it’s hard to miss the rust effect panels which line the walls, and the compass rose on the floor – giving the modern structure an antique air which is fitting with the theme of the Titanic. The exhibition portion of the building consists of ten galleries: Boomtown Belfast, The Shipyard, The Launch, The Fit-Out, The Maiden Voyage, The Sinking, The Aftermath, Myths & Legends, Exploring the Wreck and the Ocean Exploration Centre – each of which contain a series of interactive exhibitions. As you enter the exhibition space, you learn a lot of interesting facts about Belfast’s industrial past including the linen and rope works and the production of cigarettes. The center-piece of this section is the interactive map of Belfast which you hover over with your hand to learn more about the individual sections of Belfast’s history. This is great for kids who love to get their hands on anything and for adults who want to learn a bit more about the past of this great city. You also learn how to send a distress telegram and can look at miniature models of areas of the shipyard itself. You exit this part of the exhibition through the original gates of Harland and Wolff and you enter the drawing rooms and planning offices of the shipyard which have an interactive floor. Visitors ascend a replica of one of the huge pillars of the Arrol Gantry and then they embark on the Shipyard Ride. You climb aboard a futuristic car and are transported back in time to the Shipyard of the 1900s. 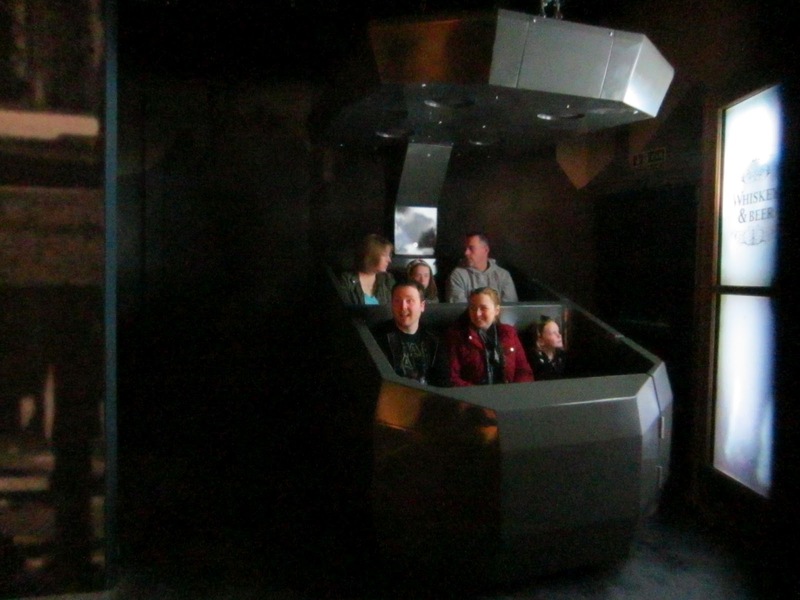 The ride uses special effects, animations and full-scale reconstructions to really give you a feel of how the Shipyard would have been at the time of the Titanic’s construction. The sights and sounds really do the trick, there’s also the option of skipping the ride and simple reading the information. As you exit the Shipyard Ride, visitors are met with a huge window which looks down at the slipways themselves where the Titanic once resided. 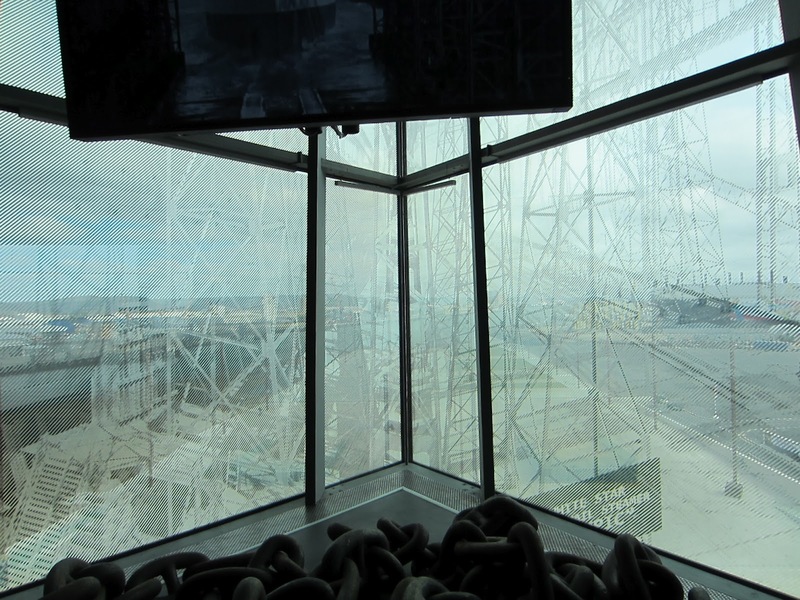 As you watch a short film of the Titanic being launched the state-of-the-art glass in the windows uses electrodes to switch from the real view to a superimposed image of the Titanic resting on the slipways. This is one of the most impressive parts of the entire building and is really a unique and novel way of recreating 31st May 1911. 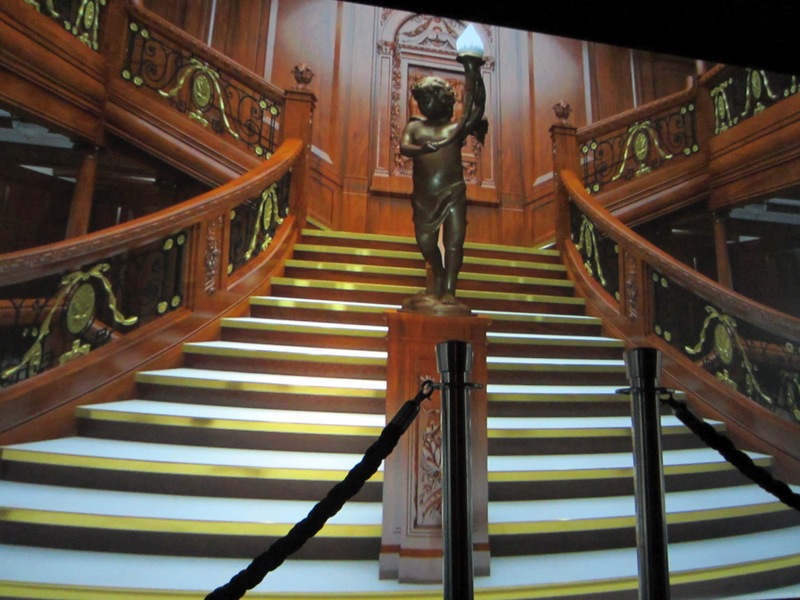 The fourth gallery is the fit-out of the ship and features a four minute video projected onto three walls which shows visitors a CGI recreation of the ship as you go on a journey through the engine rooms, dining areas and the famous staircase. You can also see replicas of first, second and third class cabins and examples of the types of carpet and linen used on board. The fifth gallery introduces visitors to some of the passengers on board and we learn about the types and amounts of supplies brought for the Maiden Voyage as it stopped off at Southhampton, England; Cherbourd, France and Queenstown (Cobh), Ireland before setting sail across the Atlantic. The sixth gallery confronts the horrors of the Titanic’s final hours and atmospheric sounds and lighting is used to recreate the night of its sinking alongside transcripts of the communications and distress signals on that fateful night. You then descend the stairs to learn about the aftermath and the enquiry which took place and then you use an interactive touch screen display to find out more about the myths and legends associated with the ship. Just when you think the exhibition is over, you enter through a set of doors and are confronted with a multi-level gallery with seating in the top half. If you sit for a while you can watch high-definition footage of the wreckage with commentary from the divers. This eerie imagery is coupled with water-effect lighting on the walls to give the impression that you’re a part of their journey. Down a flight of stairs is a glass floor with a projection of the wreckage as a whole which is very impressive and below this is the final gallery, the Ocean Exploration Centre in which visitors can access the technologies which modern ships use. Our passenger feed back has been extremely positive, the building is impressive and a lot of fun. Our passengers have found that the 2 hour visit is ample time to explore this Titanic experience. We depart Dublin at 8am following a comfort stop on route, we will tour the political murals along the Falls and Shankill roads, before our arrival at Titanic Belfast for a timed slot at 1120am. On arrival a crew member will step onto the bus for a short introduction and overview of the facilities in the world’s largest titanic experience. You will then be taken into the building, and fast tracked to the first level. ( no queues) as Day Tours Unplugged have a pre-booked slot. There are audio sets available for our guests with all major languages catered for (small local charge will apply) The feedback from our guests regarding the audio sets has been extremely positive. (make sure you have £££ Sterling £1.50) As the centre can be busy there have been long queues at both coffee shops, and gift shop, dont panic, as we will be heading next into Belfast city where you will have approx. 2 hours free time to explore. If you miss the gift shop at the centre we have been made aware that the tourist office in Belfast city has all of the Titanic souvenirs plus much more. You will be dropped at Belfast city hall and are free to explore the city. Most of our passengers to date have done a wee bit of retail therapy, or just simply grabbed a coffee or a pint. After an enjoyable visit to this vibrant city, its finally time to depart, your tour guide will pick you up at Belfast city hall at 15:30 hrs for our return to Dublin at 18:00 hrs. What do you need to bring with you on this unique Belfast day tour? A smile, camera, comfortable walking shoes, and please remember you are entering Northern Ireland, you will require £££££ Sterling, our passengers have indicated that it appears none of the shops will accept €€€ Euro (You can always us major credit cards) however there will be fees associated with credit card transactions. The Titanic Belfast day tour now includes all transfers from Dublin to Belfast, the tour departs Dublin at 0800 am with comfort stops on route. We arrive into Belfast and will visit the political murals on the Falls and Shankill roads, we will also visit the peace wall. Entrance into the Titanic experience in Belfast is included in the ticket price. We have guaranteed slots. Once you book with us there are no queues for our group, as we are fast tracked into the Titanic centre. You will be in the centre for approx. 2 hours, for our international visitors the Titanic centre has audio guides in all the major languages. There is a small charge which is paid to the center on your arrival. So far our Spanish and French guests traveling with us have indicated to us that the audio facilities are good and well worth paying the extra £1.50 sterling. The story of Belfast Zoo begins with the city’s public transport system. In 1911, the tram line was taken over by Belfast Corporation, now Belfast City Council. In 1933, the corporation decided to install a representative zoological collection on the site. Then, in 1934, 12 acres on either side of the Grand Floral Staircase, a series of steps designed to reach the top of the hillside, were laid out as Bellevue Zoo. The zoo was opened on 28 March 1934 by Sir Crawford McCullough, the then Lord Mayor of Belfast. Many of the animals in the zoo’s first collection arrived in Belfast by boat. Daisy the elephant travelled on the Heysham steamer and, after she was removed from her crate, she was walked by zookeepers from the Belfast docks to Antrim Road, a distance of between five and six miles! In 1941, the Ministry of Public Security ordered the destruction of 33 animals after north Belfast came under aerial attack during World War II. Animals, including lions, wolves and polar bears, were killed and the collection was not restocked until around 1947. By the time the corporation’s parks committee took control of the site in 1962, restoration was badly needed and work began on the new zoo site in 1974. Since then, the council has continued to support the zoo, donating £1.5 million every year to help run and promote the site. If you would like to receive an information pack about the zoo’s history, email history@belfastzoo.co.uk or call 028 9078 2082.